Since 2014, DeRay McKesson has become a leading voice in the Black Lives Matter movement, an unsuccessful candidate for mayor in his hometown of Baltimore, a podcast host, and now he's written a new book, On the Other Side of Freedom: The Case for Hope, that tells his personal story along with his current thinking about activism. 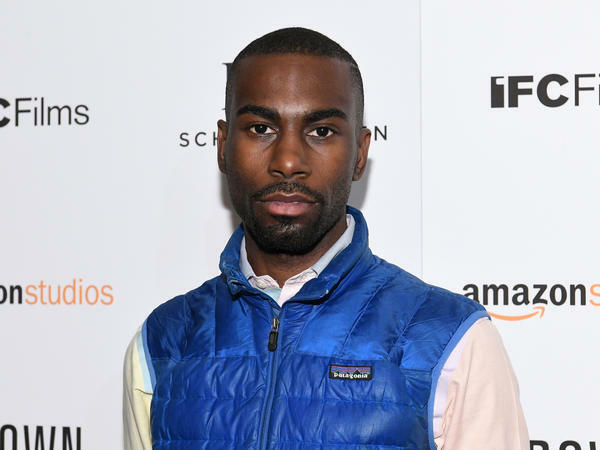 You might not know his name and you might not know his face, but there are two things you might very well know about DeRay Mckesson: his blue vest and his tweets. Both became synonymous with the protest movement that developed in the wake of the killing of Michael Brown in Ferguson, Mo., in 2014. Since then, Mckesson has become a leading voice in the Black Lives Matter movement, an unsuccessful candidate for mayor in his hometown of Baltimore, a podcast host, and now he's written a new book that tells his personal story along with his current thinking about activism. It's called On the Other Side of Freedom: The Case for Hope. Mckesson spoke with All Things Considered host Michel Martin about his journey into activism, how he presents his work and why he still has hope for the future. Mike Brown got killed on August 9th and I used to be a teacher — I worked in public education. I saw that a teenager got killed and I was like, "I'm not doing anything this weekend, the least I can do is go see it with my owns eyes." I get down there in Ferguson on the 16th. We were in the street for 400 days. People forget that it was a leave at a standstill in August, September and October of 2014, that if we stood still for more than five seconds we were arrested. It was wild. I will never forget those moments. It's one of the reasons why I continue to wear this vest. It reminds me that those things happened and that was real. I was going through this period where I felt like people gave these great speeches and didn't follow it up with action. I would be in these rooms of educators and people would be like, "Kids are the most amazing," and you look at the practices and you're like, I don't know if you actually believe in kids the way you say you do. I give a lot of lip service to living the commitment, the least I can do, the bare minimum, is to go down on Saturday and Sunday. When I got there I was like all the other stuff doesn't matter. When I got into the street, it was the first time that I had seen so many people committed to working this way and I realized that I had a platform and that people were listening to me in the protest. I was like, I gotta figure out how to use it for good, and the rest, I guess, is history. We have to start talking about all of who we are because all of who we are shows up in the work that we do. So in that chapter on my mom, I know that I struggle with ideas of worth and memory and that is deeply rooted in her. I know that I'm a gay black man every time I come into a space, and what does that mean to be in movement spaces or other spaces where people are homophobic, but like me. I wanted to write about that. I didn't know how to write a book about justice or about where we've been and where we go without also saying here's who I am in those ways. I try to do it in a way that says, "Here's who I am and here's what I think that means and here's the lesson I've learned." There's a pessimism that I think has arisen in this moment where people are like, "We're doomed." There's a doomsday sort of scenario, and I get it cause of what's happening in the White House and the other places can lead to that, but when I think about why people are out in the street and why people are running for office, that is hope work to me. Like I say in the book, hope is this belief that our tomorrow can be better than our today. When Martin Luther King, Jr. says that the arc of the moral universe bends toward justice, that's about faith. But when we say the arc bends because people bend it, that's about hope. The first sentence of that essay is, "I learned hope the hard way." I learned hope by being dragged out of the police department by my ankles and being shot down with rubber bullets and things like that. I had to ask myself: "Why am I still on the street? Why am I still committed to this work?" Polarization thrives in a context where everything is a version of the extremes, and what I believe fervently is that the stuff we're fighting for isn't extreme. We can live in a world where the police don't kill people. That to me seems pretty simple, I don't need to shout that. I was on a panel once with a police officer and she said to me, "You know DeRay, there's a lot of people in the world who do bad things, are you saying the police should never kill somebody?" And I say, "Tell me when the police should kill somebody you love," and she's like, "I don't know." And I don't know either. It is sort of putting people in a situation where we realize that some of this stuff doesn't have to be the most complicated thing. Part of this work is saying it in simple terms to have people grapple with it and not be able to dismiss it by the delivery, not be able to dismiss it because they're like, "I don't understand." I'm going to make it as basic for you as I can. When I think about leading a city or leading a community, it's about saying "This isn't working." It doesn't matter if you're a good person or not, this isn't working. You think about the city of Baltimore and we spent $500 million on police. They clear very few crimes at all. A whole division of the police department just got indicted by the FBI. A leader says this isn't about you being a good person, this is about this isn't working. I meet so many people every day who, for the first time, have found their power. ... What I've seen all across the country — I've been in streets, I've been in jails, I've been in communities — trying to help people unlock their gift that they're going to keep long after I see them or anyone else, and when they do it, that's when you know that you're getting people ready to do the work to change the world. You might not know his name, and you might not know his face, but there are two things you probably know about DeRay Mckesson (ph) - his blue vest and his tweets. Both became synonymous with the protest movement that developed in the wake of the killing of Michael Brown in Ferguson, Mo. in the summer of 2014. Since then, Mckesson has become a leading voice in the Black Lives Matter movement, an unsuccessful candidate for mayor of his hometown of Baltimore, Md., a podcast host. And now he's written a new book that tells his personal story along with his current thinking about activism. It's called "On The Other Side Of Freedom: The Case For Hope." And DeRay Mckesson is here with us in our studios in Washington, D.C.
DeRay, welcome. Welcome back. Thanks for joining us. DERAY MCKESSON: It's good to be here. MARTIN: The reason I said welcome back is this isn't the first time we've spoken. MARTIN: We actually met in Ferguson, when you were part of one of the community conversations. MCKESSON: That was a long time ago - in the church? MARTIN: And you had picked up and moved to Ferguson to be part of the protest movement. You're not from there. You had a job. You had an apartment. And you packed it all up, and you moved there. Just take us back to that. Why did you decide to do that? MCKESSON: You know, I - Mike Brown got killed on August 9. And I used to be a teacher. I worked in public education. I saw that a teenager got killed, and I was, like, I'm not doing anything this weekend. The least I can do is just go, like, see with my own eyes. I give a lot of lip service to, like, living the commitment. The least I can do - like, the bare minimum - is go down on Saturday and Sunday, right? And when I got there, I was - like, all the other stuff doesn't matter, right? That, like, I had achieved the success I had been told was success early. I made a $100,000 a couple of years before that. I was one of the highest-ranking people in the school system in Baltimore. Like, I did those things, and they were cool. They weren't necessarily the most, like, life-fulfilling, but they were important things to do in the world. And then, when I got into the street, it was the first time that I had seen so many people, like, committed to working this way. And I realized that I had a platform and that people were listening to me in the protests. It was - like, I've got to figure out how to use it for good, and, like, the rest, I guess, is history. But that was important to me. MARTIN: As I mentioned earlier, this book does two things. On the one hand, it tells your personal story. On the other hand, it does make a very considered case for activism in the current moment. So I want to take those two step by step. And the first thing is I wanted to go back to your personal history. You talk about your parents, who both struggled with addiction. You talk about your mother leaving the family when you were only three. You talk about being gay. You are very revealing, and some of this is very raw. And I was wondering about that decision because it seemed, in the early days of your visibility, you made a conscious effort not to talk about your kind of backstory. Why was it important for you to lay yourself bare, if I can put it that way, at this point? MCKESSON: You know, we have to start talking about all of who we are because all of who we are shows up in the work that we do. So in that chapter on my mom, it's, like, I know that I struggle with ideas of worth and memory, and, like, that is deeply rooted in her. I know that I'm a gay black man every time I come into a space. And I'm, like, what does that mean to be in movement spaces or other spaces where people are homophobic but like me? And it's - like, and I wanted to write about that. So, you know, I didn't know how to write a book about justice or about where we've been and where we go with. I'll - also saying, like, here's who I am in these ways. And, like you said, I try to do it in a way that says, here's who I am, and here's what the lesson is that I've learned. MARTIN: So let's talk about some of the ideas in the book. The subtitle is "The Case for Hope." Why do you need to make a case for hope? MCKESSON: You know, there's, like, a pessimism that I think has arisen in this moment where people are sort of like, we're doomed. There's, like, a doomsday sort of scenario. And I get it because what's happening in the White House and other places, like, can lead to that. But when I think about why people are out in the street and why people are running for office, that is, like, hope work to me. And, like I say in the book, hope is this belief that our tomorrows can be better than our todays. So when King says the arc of the moral universe bends towards justice, that's about faith. But when we say the arc bends because people bend it, that's a statement about hope. And, like, hope - I realize - I learned it in the first incident - I say is, I learned hope the hard way. It's, like, I learned hope, like, being dragged out of the police department by my ankles and, like, being shot at with rubber bullets and things like that. Like, I had to ask myself, like, why am I still on the street? Like, why am I still committed to this work? MCKESSON: You know, this is interesting. I'm glad you said it this way because this leads to a point that I wanted to make - is your concepts are presented in very straightforward, very simple language, which is one of the reasons you're so good on Twitter. I remember at one of the community forums somebody asked you, what is it that you want? Like, what do the protesters want? And you said, stop killing us. You're thinking sort of very straightforward, and you don't use a lot of, big, words in there. So it makes me wonder - it seems simple to you. Why do you think you provoke so much fury? MCKESSON: Polarization derives in a context where everything is a version of the extremes. And what I believe fervently is, like, the stuff we're fighting for isn't extreme, right? Like, we can live in a world where the police don't kill people. That, to me, seems pretty simple, right? I don't need to shout that, right? That seems, like, pretty simple. So I was on a panel once with a police officer, and she said to me, you know, DeRay, there's a lot of people in the world who do bad things. Are you saying that the police should never kill somebody? And I say, tell me when the police should kill somebody you love. She's, like, I don't know. I'm, like, well, I don't know either, right? Like, it is sort of that - like, putting people in a situation where we realize that some of this stuff doesn't have to be the most complicated thing. Like, I want you to tell me, what is a mistake, what's the crime that your kid could commit, and you think somebody should just shoot him in the head? If you can't name that for me, then, like, why should another parent have to? Like, that's not fair. And part of this work is, like, saying it in simple terms to have people grapple with it and not be able to dismiss it by the delivery, not be able to dismiss it because they're, like, I don't understand it. And I'm going to make it as basic for you as I can. And Twitter really was a thing that taught me that. MCKESSON: ...Know if it's about sympathy, but do I understand it? Yes. So when I think about leading a city or leading a community, it is about saying that, like, this isn't working. It doesn't matter if you're a good person or not. This isn't working. So you think about the city of Baltimore. We spend $500 million on police. They clear very few crimes at all. A whole division of the police department just got indicted by the FBI. A leader says, this isn't about you being a good person. This is about this isn't working. In the same way that I think about when I visit classrooms in school - I was the chief of human capital in the school system of Baltimore. When I visit schools, I'm not going around saying, hey, is this teacher, like, a nice person? Nobody's learning in the class, like, kids are getting suspended left and right. But, like, oh, they're really nice. Therefore, I'm just going to, like, let kids suffer in this building with all these nice people who can't teach. That would never be acceptable for people. I don't know why people put forth that argument is an acceptable argument with the police. MARTIN: So what's keeping you hopeful - you? MCKESSON: You know, I meet so many people every day who, like, for the first time they found their power, and, like, it reminds me of being a teacher. I used to teach sixth grade math, and, like, that was the joy every day. You walked in the classroom, and you're - and there was all these students who, like, didn't think that they could do math well. And then they were, like, I can do it. And you're, like, you can do it. What the best teachers know that you already had the gift before I came in the room. But part of what I'm supposed to do as a teacher is help you find the gift every day long after I'm gone. With the worst teachers do is say the gift only exists in my presence. And that's the same thing with activism and organizers. The best organizers do is go into places and say, you got it. You already got it. I'm just here to help you unlock it. And I want you to be able to unlock it long after I'm gone. And what I've seen all across the country is, I've been in streets, I've been in jails, I've been in communities trying to help people, like, unlock their gift that they're going to keep long after I see them or anyone else. And when they do it, it's, like, that's when you know you're, like, getting people, like, ready to do the work to change the world. There's nothing more hopeful than that to me. MARTIN: That is DeRay Mckesson. His new book is called, "On The Other Side Of Freedom: The Case For Hope." DeRay Mckesson, thank you so much for talking with us. MCKESSON: Good to be here. Transcript provided by NPR, Copyright NPR.